2014 was a busy year and its end I realized that I haven't written anything at my blog about several interesting events that I visited. Tizen Developer Conference is an annual event dedicated to the Linux-based software platform for all device areas Tizen. 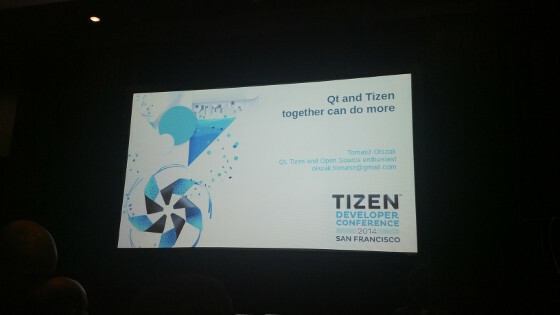 The third Tizen Developer Conference took place again at San Francisco. The event lasted 3 days for 2 to 4 June. The conference started with registration and technical showcases. As usual the biggest and most interesting booth were those of Intel and Samsung. During the registration attendants received a lot of goodies, including the book, published by WROX, “Professional Tizen Application Development" and an Intel NUC. All visitors at Tizen Developer Conference also received a Samsung Gear 2 smart watch powered by Tizen. A lot of demonstrations with this watch as well as with Gear 2 Neo and the smartphone Samsung Z were presented at the Samsung booths at the room for technical show cases. The developers at the booth of Eurogiciel Group were kind enough to assist and help people quickly install Tizen:Common on their Intel NUC devices. 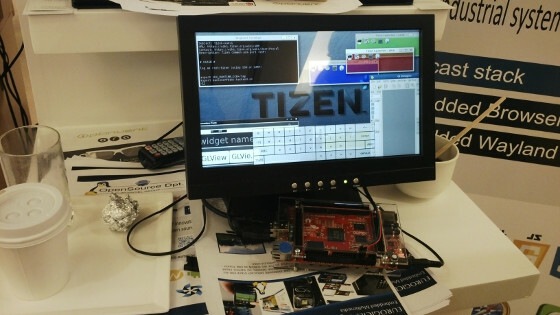 On their boot anyone was able to experience a multi user demo on Tizen:Common which was running on Intel NUC devices as well as the open source hardware development board A20-OLinuXino-MICRO manufactured by Olimex with ARM SoC from Allwinner Technology. The second day of the conference started with key notes from Brian Warner, Mark Bryan, Monica Lam and a panel discussion. You can enjoy the full video at the YouTube channel of the Tizen association. I had the honor to be the first speaker at the room for "Tutorials & Community". I spoke about "Porting Tizen to open source hardware devices for beginners". Right after that Philippe Coval, also known as RzR share details about "Cooperating with upstream projects / Packaging tips and tricks". 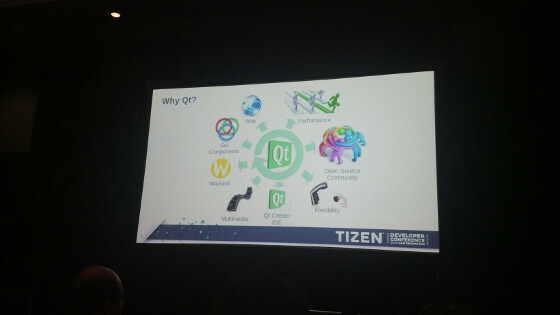 One of the other very interesting presentations was about Qt and its usage in Tizen by the co-founder of Qt for Tizen Tomasz Olszak. After the lunch break the conference continued with more presentation spread into several rooms. One of the nice presentations that I attended during the afternoon was IoT Cloud enabled Tizen for Connected Car by Joe Speed. 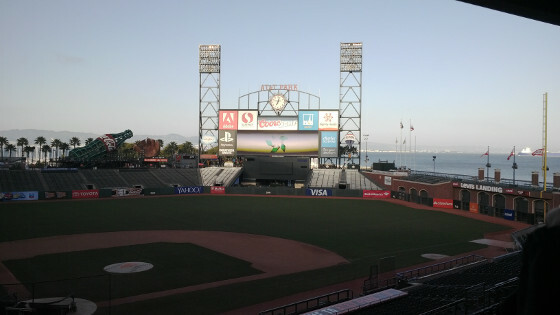 The long day ended with a glamorous party at AT & T Park the home of the San Francisco Giants baseball team. The third and last day of Tizen Developer Conference 2014 was split into two parts. During the morning there were several presentations. At the afternoon there was a huge Dev Lab for Tizen application development for mobile and wearable devices.